I'm not sure if this is the proper place to post. I damaged the top of my TOM years back by having it under a light on the wall. If anyone could please advise the simplest way to do a decent repair and what color paint would match to touch up? You might as well bondo if you're going to fix it. I was thinking would probably need bondo. That would work for the top, but isn't the front going to look funny? Still need to match the paint there as well. Is there a certain brand of gloss black? Rustolium is pretty good. That's what I use for touch ups. That should work fine. A brush would work for that small area but you can spray it also if you like. If you do a decent job sanding and don't glob the paint on there then it will turn out fine. Its on the top of the cabinet with no artwork on it so it will be difficult to mess it up. My concern would be the front where the bondo is will look different than the rest of the front. Is there just nothing that can be done about that? I'd rather not spray, that means lots of taping. It looks like the front doesn't have as much damage as the top. It appears like just the edge needs to be repaired. Yes, but it will still be a bit of the front. It really wont be noticeable. Better than the way it is. so for the paint, can I just paint the area, or do I have to paint all the black around the cabinet? Well is it satin or glossy? Don't really have any place I can take some paint from to have it matched, but after just going that with the interior wall of the house, I wouldn't have high hopes matching a glossy paint. I'm surprised no one else has commented. But I have done full cabinet restorations and small touch ups on B/W cabinets and I have always used satin black. To me it blends quite well. I would not brush paint with a regular brush, you will definitely see the strokes with black paint. For most areas I spray and just hold a piece of cardboard over the area(s) I need to protect. 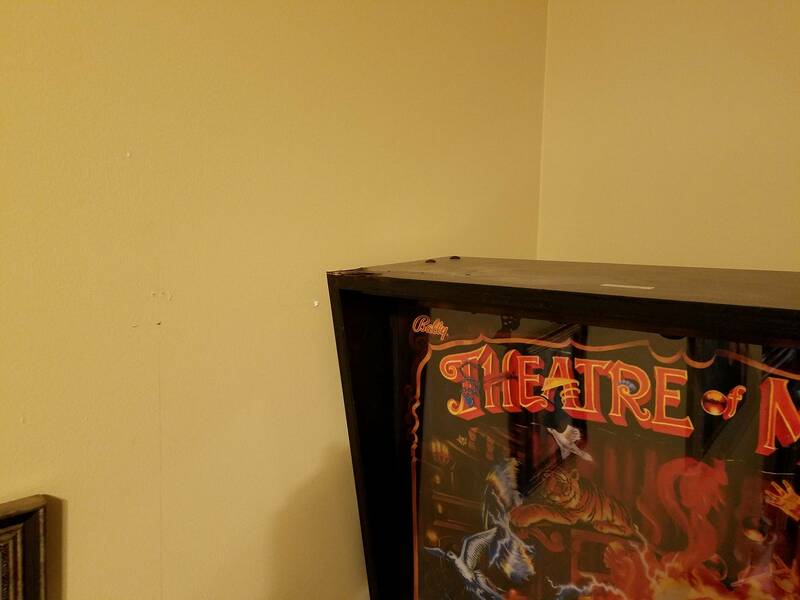 Cover the Playfield glass with something so paint will not settle on it from the air. For really small areas you can spray one of those small foam brushes and use that to apply the paint and it will blend well. I just did touch up on the front of a TOM that I picked up a few weeks ago, used the small foam brush with a little of the rustoleum satin black sprayed on the brush. You cannot see the freshly painted area. After coming home and looking over a few of my cabinets - its Satin. 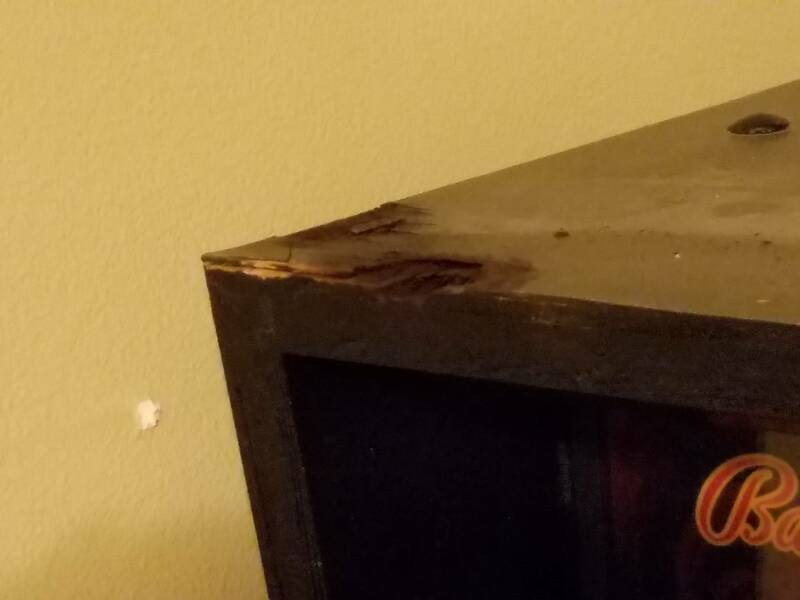 Listen, youre not going to screw up painting a part of the cabinet maybe a few people will ever notice. Its one color that you don't even have to match. You cant really mess it up except for the filling/sanding. If its not the right sheen then go glossy.